Loyal Contributors are individuals that have been giving to any United Way for 10 years or more. Giving does not have to be continuous. Community Conversation (April 2015): Loyal Contributors gathered for an afternoon of cookies and conversation to share their aspirations for our community. Grand Avenue Club Art Exhibit (November 2012): Loyal Contributors celebrated the opening of the Grand Avenue Club's Art Exhibition at Gallerie M in the InterContinental Milwaukee. Join the Loyal Contributor program. For more information about Leadership Giving Programs, please contact Megan O'Halloran via email or at 414.263.8190. 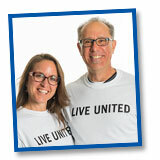 We give to United Way because they focus on the most significant issues affecting the quality of life in our community. We know that nearly 90 cents of every dollar we give goes directly to United Way-funded programs. Whenever we hear a story about the success of a United Way-funded program, it reaffirms that we are having the greatest impact with our donation.